Lightweight, tough and dependable, the Econoline Garrison Belt from DeSantis is an affordable duty belt that compliments any law enforcement or tactical professional's uniform. The belt is constructed from multiple layers of bonded leather and sealed with a polyurethane laminate to deliver the rigidity and strength needed to support holstered sidearms, radios and other gear. 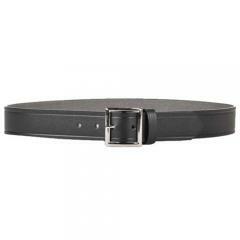 A sleek, leather-like finish gives this belt a crisp, professional look that meets regulation dress standards. A square, nickel enter-bar buckle secures the belt in place, ensuring pants and gear stay at the waist regardless of physical activity. Available in plain and basketweave finishes, the Garrison looks great with any personal style. Quality belt. Have no issues.